June 2015 marks the 12th anniversary of the formation of Andrews Automation Automation System Integrators. Originally based in Warwickshire the Company now operates from offices and manufacturing facility in Howden, East Yorkshire. Andrews Automation offer a unique combination of engineering skills and a wealth of experience in providing materials handling solutions both simple and complex, tailored to suit individual requirements in a wide range of industries. 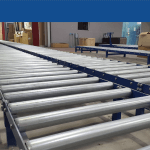 We have a comprehensive range of equipment available to provide complete automated turnkey materials handling systems, including design, installation and commissioning conveyors with integrated controls and software. We also incorporate full project management to co-ordinate our mechanical and electrical conveyor installation teams in-line with the customers overall project program. Andrews Automation Automation System Integrators provide a tailored service with the majority of our equipment manufactured here in the UK – allowing us to support our installation with ease.